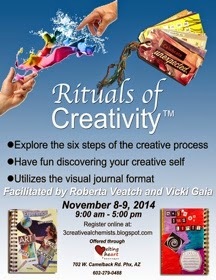 Roberta and I are thrilled to be teaching our popular online Rituals of Creativity™course as a two day hands-on workshop at Melting Heart Boutique in Phoenix. You will explore the six steps of the creative process, while having fun discovering your creativity by utilizing the journal format. November 8-9, from 9:00 a.m to 5:00 PM. To learn more and register for the class, visit our workshop page. Thanks for this Debi. I was wondering where you were and if you benefited from the course. We are so excited to hear from you and hope you keep in touch. Our FB group is up and I will try to friend you so you can join unless you already have. It is a continuation of beauty, creativity and a place to stay connected! Cheers!